She is the presiding deity of Mantralaya and everybody has heard of her. She allowed our beloved Rayaru to construct his Brindavana in Mantralaya. Rayaru had decided to enter Brindavana in Mantralaya which then was called Mante Sale. This area came under Siddi Masud Khan of Adoni. Venkanna was the Dewan of Adoni province and he was a devotee of Rayaru. When Rayaru asked Venkanna to allow him to construct a Brindavana, Venkanna’s joy knew no bounds. However, his joy was shortlived when he realised that Manta Sale had already been gifted to a Sufi saint. Siddi Masud Khan and Dewan Venkanna went into a huddle. They then came up with a solution, They granted alternate land to the Sufi saint and requested him to give up Mante Sale. The saint did so gladly and Rayaru got his wish. Rayaru told Venkanna that he wanted to enter Brindavana at Mantralaya as this was the place where he as Prahalada had done penance. Rayaru then sought permission from Goddess Manchalamma for constructing his brindavana. The Goddess readily obliged. She appeared before Rayaru and forecast that this place would be so well-known that devotees would only flock to his temple and no other temple. She also remarked that people would forget her and her temple. Rayaru then told the Goddess that he would bless devotes only if they saw her first and then had his darshan. Even today, this holds true and devotes are expected to see the Goddess first and then enter the abode of Rayaru. The Manchalamma temple is situated on the right hand side of the matha. The idol of the goddess is small but beautiful. She is the presiding deity of Mantralaya. The fame of Manchalamma increased after the devastating floods that submerged Mantralaya in October 2006. 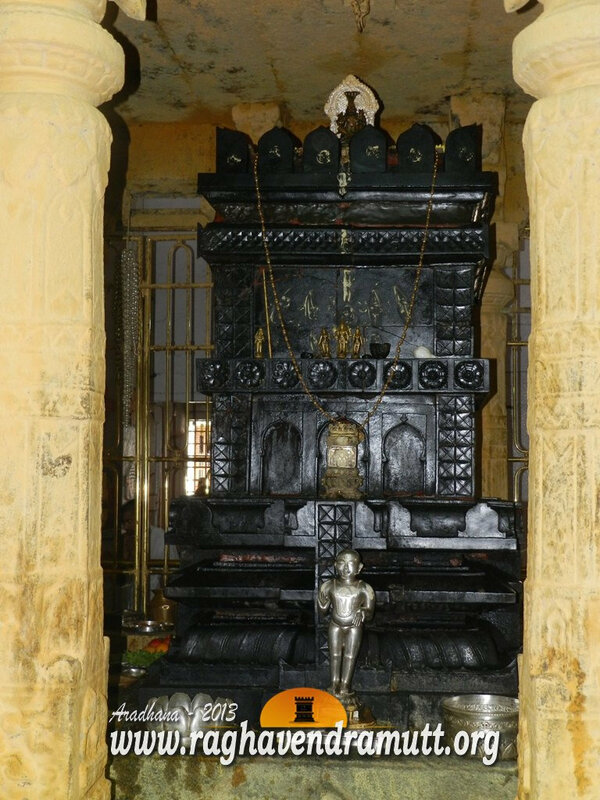 Many people, including astrologers blamed it on the fact that the Raghavendra Matha authorities had delayed repair and renovation of the Manchalamma Temple. The Goddess had, therefore, taken her revenge. The floods had wiped out almost the entire Mantralaya except the Venkataramanaswamy Temple atop a small hillock in Mantralaya village. All the shops, boarding houses and guest houses, dormitory and even the math was submerged. If this could be the religious reason, the scientific reason is that the tributaries of the Tungabhadra discharged so much water that the levels of Tungabhadra rose dangerously in Kurnool district (where Mantralaya is located) and other places including Hampi. When I checked the water discharge levels of the Tungabhadra Dam, I found that when the floods came calling, the dam had discharged between one lakh cusecs and 1.49 lakh cusecs during the first week of October 2009. Incidentally,over some weeks during earlier years, the authorities had discharged more than 2 lakhs cusecs. The Tungabhadra Board, the interstate body comprising of officials from Karnataka and Andhra Pradesh, which monitors discharges from the TB dam in Hospet, would normally notify the local authorities an district administration of low lying areas in the case of heavy discharges. But no such warning was issued. Several smaller rivers and tributaries of the Tungabhadra such as Hagari (also known as Vedavati), Hirehalla and Narihalla discharged heavy amounts of water, leading to flooding. The areas of Bellary, Siriguppa and Hagari had received very heavy rainfall and they had led to enormous water flow into the tributaries. The Hagari joins Tungabhadra near Hachcholli in Siruguppa taluk in Bellary district. Waters from Koppal and Raichur districts also drained into the Tungabhadra, aggravating the flood situation. Though there was not much loss of human life in Mantralaya, several heads of cattle and the temple elephant died. More importantly, several priceless works, some dating back to the time of Rayaru, were destroyed. Whatever be the reason, it still remains a mystery as to why the Tungabhadra overflowed that year only. Such a spectacle had never been seen in the history of Mantralaya and perhaps never will. Today, the temple of Manchalamma is spruced up and it houses a new building.